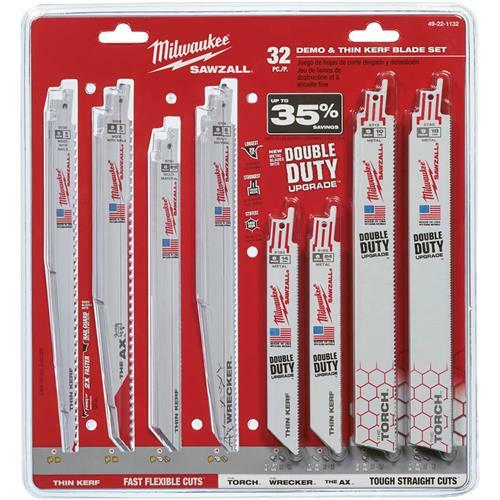 For a wide range of professional applications, the Milwaukee 49-22-1132 32-Piece SAWZALL Blade Set includes an assortment of standard wood, metal and multi-material cutting Sawzall blades. This set includes a variety of wood, metal, and multi-material cutting Sawzall blades to tackle a broad range of professional applications. Wood-cutting blades feature nail guard which combines an aggressive 5 teeth per inch pattern for faster cutting, with a unique design that protects against tooth fractures. The Fang Tip design on wood-cutting blades bites into wood on first contact for faster plunging. Metal-cutting blades with the double duty upgrade feature an optimized tooth design providing 2X more life than the previous generation.